The 35th Annual Cascade Cycling Classic has arrived. Like many cycling events, it brings a large number of people and bicycles to the area. 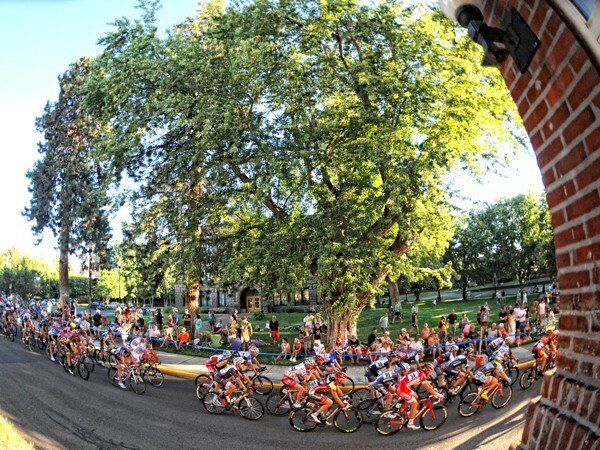 But unique to this event is the massively popular criterium race, which takes over the downtown core with the whir of sleek bodies and spinning wheels—and throngs of captivated spectators. "For spectators it is really one of the most exciting things to watch," says Molly Cogswell-Kelley, a spokesperson for the Mt. Bachelor Sports Education Foundation, which puts on the event. "It's the longest running stage race in the nation. People who don't even care about bike racing come down for this." She says anywhere from 10,000 to 15,000 spectators pack in downtown to see the cyclists fly down the straight stretches and swing around the corners as they work the rectangular track. Over the years, the criterium has become a place to be seen, Cogswell-Kelley explains. In a way, it's like the Boston Marathon. For those who compete, it's an intensely athletic event. For spectators, it's an annual opportunity to hang out with friends and witness an impressive feat—a legitimate interest in the sport is not necessarily required. Because one doesn't need to be a cycling buff to get caught up in the rush, it's an ideal event for the less-than-sporty. Cogswell-Kelley says many of the spectators don't even ride a bike, they just want to be part of the action. And it's some fast action. Professional criterium racers can reach speeds of up to 50 miles per hour—twice the legal limit for a car traveling down Bond or Wall streets. But unlike other kinds of racing, a criterium isn't just about that final finish line. Because cash prizes are awarded to the winners of multiple laps, the drama is nearly constant. "It's exciting because things change in a criterium so fast," Cogswell-Kelley explains. Lead teams fall back, cyclists shift as teams play out their strategies and, occasionally, the speed gets the better of a racer. And that's part of the draw. "There are wrecks that happen. Of course, we never want that to happen, but some people watch for that." Because wrecks and changes in position are most likely to happen on corners, they are an especially popular viewing spot. But Cogswell-Kelley says she thinks Ranch Records will be the best place to watch the race. That's because the racecourse is reversed from last year's, with the finish line near Starbucks and Pizza Mondo on Wall Street. Of course, with that number of spectators, she expects Wall Street to be "a kind of mob scene," and emphasized that speed and surprises can be found all along the course. Still, the finish line is not only where prizes for primes will be awarded, it's also where the judges for a brand new contest will make their picks for the "Most Hopped Up Rider." The contest, conceived and sponsored by Roger Worthington of Worthy Brewing, will identify the boldest, brashest racers in each category. Because the lead racers tend to play it safe, Worthington says, these aggressive riders are more likely to be found mid-pack. "We want to give an inducement to the guys who are mid pack, give them an opportunity to shine," Worthington says. "Most people are conservative in bike races, they're all deathly afraid. We want riders to throw caution to the wind and just go for it." He's offering up a fair reward for the risk. In the men's pro category, the winner gets $750, a jersey and six-pack or two of beer. The women's pro and category two winners get $500 and the master's winner will receive $250. The judges, who Worthington describes as "two Oregon boys with Super Bowl rings" are NFL players Mike Walter, a retired linebacker who played for the San Francisco 49ers and Dallas Cowboys, and Kevin Boss, a tight end and current free agent who played for the New York Giants, Oakland Raiders and Kansas City Chiefs. Worthington says other NFL players may join them at the judge's table, but they have not yet confirmed. Though the two athletes are experts in the art of aggression—Walter, he points out, "knows a few things about what it means to stuff a punk in the hole"—Worthington says they may have a tough time agreeing on a winner. If that's the case, he adds, "We may have to be Solomon-esque in our adjudications."